Online guide to collecting holograms and related laser and holography historical memorabilia and ephemera. Since 1976, I have been collecting and preserving printed memorabilia and ephemera related to the world-wide history of lasers and holography. Its scope documents over 150 years of three dimensional imaging science and technology, from the invention of stereo photography to laser holograms (only lasers and holography are included in this Flickr album). The 20,000+ piece collection consists of vintage lasers, holograms, lenticulars, documentary film, video, and photography, optics, optical equipment, periodicals, rototypes, posters, books, advertising, stereoscopes, exhibition catalogs, postcards, brochures, contracts, newsletters, stereographs, patents, documents, letters, stamps, business cards, magazines, press releases, invitations, newspaper articles, announcements, letterheads, industrial catalogs, envelopes, postage stamps, and many other examples of memorabilia and ephemera. My collection has been utilized as a resource for various media projects, with materials used in film, print and television. It has been a destination for students, educators, scientists, technicians, hobbyists and general enthusiasts, from around the world, for over four decades. The Ultimate Guide to Collecting Memorabilia and Ephemera. The field of holography (holograms and lasers) provides a wealth of collecting opportunities, and covers a wide range of interests and items. You can collect holograms only, or you can broaden your collection to include related materials and equipment. Today, with an Internet connection, it has never been easier to find related items, and to watch your collection grow. This primer is dedicated to helping you begin your own collection of holography. It has been a trusted and inspirational resource for holography collectors around the world since its first publication (in print) in 1988. It is revised on a regular basis (see date above for latest revision). Imagine this: It is one hundred years in the future. The scene is a convention dealing with collectibles from the 20th century: books, magazines, posters, record players, tapes, furniture, personal computers, and so on. In a corner, at the end of a long aisle, is a booth dealing exclusively with holography. On display are embossed holograms; DCG hologram pendants, watches, earrings, and other jewelry; large glass plate and film holograms; magazines and advertising that contain holograms; artist postcards from exhibit openings; signatures on documents of the early movers and shakers; posters and exhibit catalogs from international shows; first-edition copies of books on holography; equipment catalogs; and the center piece of the booth: an actual laser that still works. What an incredible day . . . and what an incredible crowd! Our little imaginary scenario of the future is not that far-fetched. Even today, many of the items related to holography that were once stuffed into desk drawers and filing cabinets (or worse yet, thrown away), are now looked upon as collectibles. Since we can be fairly certain that we will not be around to attend our convention one hundred years from now, why not make the most of the time that we do have by attempting to put together an impressive collection of future holographic memoribilia? You can be the one to make sure that today's historical pieces make it to the future for others to enjoy. I receive email on a regular basis from visitors to this web site, and many of those persons are asking for specific information relating to collecting. One person asked for information concerning an embossed hologram and how to acquire one for their collection. Another, from Europe, spoke of their pride in the collection of books related to holography, but added that they were concerned that it was not complete. "Could it be", I wondered, "that collecting holographic-related items was catching on around the globe?" The answer to that appears to be in the affirmative: yes, there is collecting going on, and the real surprise is that it may prove to be the most active aspect of the field. There appears to be a fever that goes hand-in-hand with the act of collecting. Collectors can go through extreme trouble searching out materials. And nowhere are those materials more new and exciting than with holography. For a field celebrating only decades of existence (the first hologram was created in the early 1960's), there is a multitude of collecting possibilities, including items that extend much further back in time. There is a rich history, and many centuries of art and science behind it: some of it extending back into the 16th and 17th centuries, which can serve as supplementary and support items to the main collection. For instance, I have recently added a very early engraving of the moon's features from the year 1683. It is to complement my own hologram of the moon. I continue to look for items to add to the collection, that will make not only a sub-collection to match my moon hologram, but one that could be considered a stand-alone collection as well. Then there is the culture in which holography was developed: how we lived our lives during the developmental years of early lasers and holograms. The music, television, radio shows, automobiles, and other everyday items that helped to define each era of holography's history. Taken as a whole, it allows us to see holography within the context of the cultural history in which it was invented. Is this necessary? Not at all. For many, it may even be overkill, or even off-topic. But for me, it provides a more richly rewarding experience of the history of holography. So, that brings us to this section of my website. It is devoted to what I call Antiquarian Holographica: searching out the holograms and other early collectibles, from around the world, to add to ones personal collection. The mission of this single page primer is to provide a simple, yet solid foundation for starting your own archive of holography. Future generations will look back in time not only through the eyes of a collector, but through a knowledgeable, protective guardian. As with any new endeavor, it is important that you have a plan -- an ultimate destination for your collection. Will you concentrate on books and paper-based collectibles, such as postcards? Are you interested in holograms? Jewelry with holograms? Art or commercial holograms? Posters and commemoratives of exhibits? All of the above, and more? Perhaps I could help by describing my own collection. I can do so in one word: everything. In my collection I have: antique lasers, holograms (laser transmission holograms, white light reflection holograms, embossed holograms, multiplex holograms, holograms on silver gelatin emulsion, on photopolymer, on dichromated gelatin emulsion, and more), optics, antique optical equipment, posters, books, advertising, viewers, exhibit catalogs, postcards, brochures, newsletters, stereoviews, patents, documents, letters, business cards, magazines, press releases, invitations, newspaper articles, announcements, letterheads, industrial catalogs, envelopes, postage stamps, and many other examples of 3D / holography history and memorabilia. Unfortunately, even in the year 2011, there is little, if any, background material available concerning holography-related collectibles. Even though collecting is as popular as it has ever been, research indicates that there is just not enough interest to publish any guidebooks (other than self-publish). This means that much of the work, along with many hours of research, will have to be done by you, the collector. The more you know, the more your collection will benefit, since much of your knowledge will be manifest through your asthetic judgements and decisions. Whatever your plan is for reaching your goal, it should never be executed in a hap-hazard way. Decisions should be made intelligently and with great care as to what is worth having. Remember, this isn't clutter or garage sale mentality we're talking about here -- but a systematic recording of the history of holography. Overall, collecting should be an enjoyable and rewarding experience. You may have a collection started already and just never looked at it as a collection. If you have only one piece, you have the start of a collection. Go through your drawers and filing cabinets, bookshelves, etc., and begin sorting things out. You may be surprised at what is there. Keep an eye out at all times for holograms and articles, books, magazines, etc. I found a matted and framed, 30 x 40cm pulsed-reflection hologram of a black panther in someones trash. The street lights lit it up as I was walking by. I kept walking thinking, "did I just see what I think I did"?" I turned around and went back, and I'm glad I did. With the interest in collecting holography continuing at an ever-accelerating pace, individuals who began their interest years ago are now becoming more sophisticated in their appreciation of the medium. The time is right for a blossoming of interest in collecting holograms . . . of all types. However, while the most prominent artists in the field are beginning to find clients who are willing to make substantial investments in their work -- the majority of these works are priced beyond the means of the average collecting enthusiast. We may begin to fill that void right now by suggesting that a would-be collector begin by concentrating their efforts on building a collection of readily-available embossed and photopolymer holograms. These holograms were (and are) mass produced and usually low-cost, and in many cases, no-cost. Now, one may immediately remark that if these types of holograms are low-cost and readily available -- what would the interest be in collecting them? To answer this, it must be pointed out that although many embossed holograms have been all around us for decades, there are many that were, and still are, very difficult to find. How does one know if this is the case or not with a particular hologram? Time and experience. One cannot always rely on the price given for a particular piece. Some sellers believe that holograms should be priced high just because they're holograms. Not so at all. The same qualities that make other collectibles worthy, make holograms worthy as well: age, condition, availability, and demand. Plain and simple, that's it. There are a few embossed holograms that are becoming harder and harder to find -- even with ebay and other auction sites. They are becoming RARE. However, once located, an older out-of-print, limited run embossed hologram is a treasure to own, view and display. It is truly a collectors piece. Also, several holographic artists have created works that were limited edition embossed holograms. It is possible to own a work by these artists at a relatively reasonable cost (compared to their glass plate and film masterpieces). Early limited edition embossed holograms, such as "Bird and Rocks" from John Kaufmann, "Magic Teeth" by Harriet Casdin Silver (which came with its own slipcase with the artist's signature on it), or "Stargate" by Dan Schweitzer would make a good central part of the collection -- while, at the same time, being much less expensive than other works on glass plates or film by the artists. This is not to say that if you can afford a more expensive original work that it should be overlooked. I'm using these examples of how your collection can contain work from prominent artists without having to break the bank. There are also holograms on magazines, books, catalogues, product packaging and brochures. These printed pieces, and the holograms they contain, would be carefully placed in archival sleeves, numbered, identified and stored carefully away from thumbing curiosity seekers. Perhaps an electronic database would be set up. Complete embossed sets, such as the "E.T" stickers from Hershey Reeses' Pieces would round out the collection. A unique and very highly collectible E.T. set would have all nine images on one uncut proof sheet of foil. These are much harder to come by than a full set of the individual holograms, so an uncut sheet would be valued more for a collection. Steve McGrew, who was President of Light Impressions (manufactured the E.T. holograms for Hershey Foods) does not even have an uncut set. Nor, as he stated during a recent HoloTalk show, would he even know where to find one. This is the perfect example of what will drive a collectibles market. I know where to find one however . . . right in my own filing cabinet, untouched and kept in a protective sleeve for decades. It would be possible to have a combination of any single group classification with any single sub-group. For instance a hologram that would be identified as C-II, for instance. This hologram, with this designation, would be an advertising piece (C), that contained a 2D-3D graphic (II). These holograms are usually packaged individually with the hologram itself acting as the only end-product. An example would be any retail hologram sold only for its own purpose -- embossed, photopolymer, silver-halide film, silver-halide glass plate, or DCG (Dichromate). These are all recording media. Embossed or photopolymer holograms utilized as part of a consumer-related product itself, or part of its packaging materials. Usually designed to attract or call attention to the product and enhance the products' visibility and/or appeal (compared to an "A" designation, which is all about the hologram and the hologram only). In this case, the hologram provides a supporting role. Also used many times by companies to promote itself as "future" oriented or having a forward-looking vision. A past example would be the rather large embossed holograms on the "Ghost Busters" series of breakfast cereal. In very vintage cases, i.e. promotional and printed items prior to embossing, this type of hologram may be a silver gelatin hologram (rather than embossed or photopolymer). The "King Vitamin" ring is a good example of an item known as a premium. Advertising can utilize just about any type of embossed hologram: be it 2D, 2D-3D, or 3D in its contained graphics or image(s). You will rarely find any type of hologram other than embossed holograms, or thin photopolymer "reflection" holograms used in advertising. It goes without saying that the content of the hologram will be geared toward the content of the advertisement, but I've seen examples where the match wasn't a good one. The best examples show how holography truly adds value to the design elements of the advertisement. The hologram "should not fight the ad" as I used to say. There ARE some great examples out there. These are usually limited-edition pieces created by an established holographic artist, with the masters made in the artists studio/lab or rental facility and then mass produced by embossing. Similar to a lithograph made from a painting. An example would be Harriet Casdin Silvers "Kunstzahne" or "Magic Teeth" which had a run of 1750 pieces and was offered in a sleeve that contained the artists signature. There are also great examples done in photopolymer material as well. This type of embossed hologram is valued as a collectible for the simple reason that something about it makes it one of a kind. An embossed hologram that still contained crop and registration marks would make that piece unique, compared to those that made it to retail sale (after the crop and registration marks had been removed). Other holograms that would fall under this category would include those that had a very limited run during experimentation on a specific production process. Also, what I refer to as "Ooops" holograms could be listed here as well. These are holograms that, for some reason, are different than the final run. An example that I have in my collection would be the American Eagle hologram on the cover of National Geographic. On all of the magazine covers, the Eagle is looking to the right. I have an exact hologram of the Eagle looking to the left. This is the same as you find in the coin collecting world -- where a very small number of coins may have been minted incorrectly. Depending on the number of coins minted, these can be extremely collectible and valuable. There are holograms that are nothing but flat line-art or graphics, and are essentially flat-surface in dimensional appearance. You'll find these mainly via product packaging, wrapping paper, and on many consumer items such as pencils, holiday ornaments, etc. Basically, they have patterns that diffract light in the primary colors of the rainbow, if they are embossed (which is usually the most common with 2D holograms). With the popularity of scrap booking and collage making increasing everyday, holograms (especially of the holographic foil type) make an interesting and unique add-on. There are the images that are also line art or graphics, and are essentially flat-surface pictures. Unlike the 2D (I) above, 2D-3D holograms will have several dimensional layers of 2D planes. Many times this second (or third) layer is a "neutral field" -- holograms of this type used a background of stars, etc. A good example for collection purposes would be the famous ET stickers found in packages of Reeses' Pieces by Hershey Foods. In fact, they were the very first example of a 2D-3D hologram. These holograms use an actual three-dimensional object (be it real or abstract) as its image. A good example would be the hologram on the cover of the National Geographic magazine of the American Bald Eagle or the issue with the Taung skull or Shattered Earth. Most of the holographic images contained within hologram jewelry are 3D objects. We should also not forget pulsed-laser portraits of people and animals. This category (3D objects) would also cover the large-format display holograms, which are found primarily on film or glass plates. These holograms can, and often do, run in to the thousands of dollars, with those of the more well-known artists fetching tens of thousands. These holograms are not out of the range of every collector, and there are collectors that focus primarily on limited edition artistic display holography. For our own purposes here, we'll concentrate on the more common and affordable holograms to collect. While a person can certainly become overwhelmed by the sheer number of holograms that flooded the market, with a certain amount of skill and work it can become possible to build quite an impressive collection. Holograms are beautiful and fun to collect. With a little luck, you can begin to build your collection without any initial cash outlay. Just keep an eye out for many "give aways" from companies, especially at large gatherings such as conventions. When MasterCard began using embossed holograms on its credit cards, they produced an annual report with a large un-cut sheet of their MC logo on the cover. I wrote to them and asked to have a copy of the annual report which they sent and I received within a few days. Not only did I now have the the MasterCard hologram, but I also had it as an uncut sheet and used in a way different than the millions of credit cards out there. Once again, this adds to the collectibility. Some folks will be perfectly happy to collect just holograms. Others look for a more well-rounded collection overall, and that means to include items that are related to holography. As mentioned earlier in this missive, those items can include (once again): antique lasers, optics, optical equipment, posters, books, advertising, viewers, exhibit catalogs, postcards, brochures, newsletters, stereoviews, patents, documents, letters, business cards, magazines, press releases, invitations, newspaper articles, announcements, letterheads, industrial catalogs, envelopes, postage stamps, and many other examples of 3D / holography history and memorabilia. Note that some of the above items may indeed have a hologram associated with it. But that is not a requirement in order to be a part of the collection. In fact, the largest percentage of items within the Antiquarian Holographica collection are non-hologram collectibles, or items that do not contain a hologram. The majority are various paper-based items that are about some aspect of holography and its history. This is one of the most difficult aspects of a holography collection to get across to the general public: that the items in the collection do not have to have holograms at all. For instance, if I mention postcards, people naturally assume that the postcard either contains a hologram, or the image on the card is a hologram. I displayed selected postcards from my collection recently, and I was surprised to find out that, after a presentation and explanation, people were expecting to see three dimensional images appear on the cards. It is very difficult to change someone's thoughts once they are set. I can only hope that I can make myself clear to you, dear reader, in the hopes that you can gain the understanding necessary to expand your own collection beyond that of only holograms. I especially enjoy how holography was (and is) used in advertising . . . and the older pieces (pre year 2000) hold the most interest for me. I have my own collection broken up in two categories: one is of advertising that contains a hologram, and the other is advertising without a hologram. Both should be represented in any collection. I have always found it interesting to see how a three-dimensional hologram would be incorporated into the overall design of the ad. Sometimes this worked out well, others times not so well. Of course, that's all a matter of personal taste (overall), but there are some do's and don'ts in advertising design, and its always interesting to see both ends of the spectrum (and holography has plenty of both!). Books would be represented dealing with holography and its branches of lasers, light and even philosophy. One thing is certain -- books *can* be an expensive part of collecting. Many books dealing with holography are not yet old enough or published in large enough numbers to be easily found on the used book rack. However, Ebay and other used book web sites are certainly options worth exploring. Remember though, holography is a technical science, and technical manuals can run up quite a bill. Fortunately, there are enough over-the-counter, inexpensive soft-covers to keep a collector busy for a long time. First editions, especially those that are out-of-print, are a collectors dream and a field unto itself. They are the cream of book collecting. Whether you need first editions or simply a lightly handled later edition is a matter of preference. First editions accumulate the most value as the years go by, so looking to the future is a consideration that must be eventually confronted. Some predicted that the Internet would bring death to the humble paper-based business card, but as of 2011, I don't see any indication of that at all. What the Internet has brought is a multitude of online printing companies all waiting to print them. There are more people today with business cards than perhaps any other time in history. That being said, I have seen a decrease in the interest in collecting business cards, along with associated groups and clubs. At one time, business card collecting enjoyed local and national trading clubs, with regular meetings and had their own events, similar to postcards. Not so much any longer, but not totally gone, either. There are two things to keep in mind when collecting holography-related business cards, compared to to having a general collection: (1) there are no world-renowned "names" to collect (names that would be known outside of the field), and (2) nor are there multitudes of cards. Showing a Juris Upatnieks business card to someone would not elicit the same reaction as a business card once belonging to a Donald Trump or a Bill Gates type of personality. Its just not going to happen. So, in this one instance, you're going to have to accept that not many in the general public will show much interest in a holography-related business card collection. Business contracts are usually more difficult to come by than other paper-based items. Some folks would lump contracts into the Ephemera category, but I do not. They were kept for the long term, many times due to federal laws. So they certainly were not ephemeral by their very nature and intention. So I list them under their own category since, like postcards, they are so unique in-and-of themselves. If you are able to find contracts that include samples of the holograms covered in the contracts, all the better. To obtain pre-production pieces (before ever being released to the public) is even more rare. Other points to consider are: does the contract contain the company letterhead? Is it signed by representatives of both parties? Are there specific production instructions listed? Are pre-production hologram samples included? All of these points can add interest (and value) to items in a collection of contracts and work orders. Ephemera is any paper item that was designed to have a short lifespan. A train ticket is a perfect example: once used on its date and time, it no longer was needed and would be discarded. Other items could include a bill of sale, or a broadside (leaflet). For some, posters fall under this category. Ephemera is usually something that would have been discarded, due to its usefulness being expired. It usually would not include something that would have been kept due to its design or art work (like a poster). The definition of ephemera continues to evolve in the age of the Internet. I happen to be more of a traditionalist, which means that I do not accept many of the various items that are now classified that way. The traditional view of ephemera is that it is a paper-based item that would usually be thrown away after its intended use was over. Ephemera is, however, my favorite category of my own collection. It took various optical equipment to create the holograms that are part of your collection. Equipment can be placed into a category that covers any item in holography that provided a function in creating a hologram. In addition to vintage lasers, one might focus their "hardware" collection on: beamsplitters; plate holders; various optical mounts (for mirrors and lenses); spatial filters; pin holes assemblies; objective lenses; simple standard lenses (of all shapes, sizes, and focal lengths); collimating mirrors; vibration isolation equipment; safe lights; vintage film and glass plate boxes; old processing trays; darkroom chemical bottles (in clean condition); drying racks; spin coating machines; and the list can, and does, go on. Equipment catalogs are highly collectible. They show photos of the eras' existing technology, and may also give technical drawings. As the field progresses and gas lasers, mirrors, lenses and filters are gradually replaced by semiconductor lasers, fiber optics, holographic optical elements, and computers -- and whatever will come after that -- these catalogs will take on an air of nostalgia. Just call a company and ask for a catalog. Most are more than happy to reply. One of the burning questions with equipment catalogs is to cut or not cut. What this means is: should you keep your catalogs intact, or should you cut out individual pages for display. There's heated debate on this. One thing is certain: there are plenty of equipment catalogs out there in circulation. They're in filing cabinets and desk drawers (and storage boxes) everywhere. It is not like you're cutting up the last copy on Earth. That's not an opinion, it is a fact. On the other hand, it boils down to whether you feel comfortable cutting up a catalog or not. I haven't cut any of mine. Yet. But it is only because I haven't gotten to that point in the collection yet. I would love to see individual illustrations, diagrams and equipment photographs displayed in separate sleeves. I must use the word "antique" very carefully here, because it is usually relied upon to designate an item that is at least one hundred years old. In our case, the laser was invented in 1960, so we're only halfway there (as of 2011). But technology has moved very rapidly during the past half-century, to the point of making the original lasers seem antique indeed. In any case, there are now several regular collectors of antique lasers. I have a few in my own collection, but certainly nothing of the calibre of the collector who focuses their efforts entirely on laser history. With lasers, however, one thing is certain: they will continue to be manufactured and available for many decades into the future. From past life experience, I would not go so far as to say that they will be with us forever. When you've lived long enough, you get to see how things change over and over again. But they will be around providing light for computing and communications for quite some time into the future. With collecting lasers, one should not neglect the power supply, whether as part of the complete system (laser head and its matching power supply), or even as a single, stand-alone unit, or an entire collection of only power supplies. Some early power supplies dating back to the 1960's have an incredible science-fiction look to them, with their analog dials and read outs. A laser head may not give very much indication to its age or era, but a power supply certainly will. Letters and autographs are collectibles. Another area of current collecting interest (and a hot one at that) is cancelled personal checks. Letters are more of a personal collectible, since many shouldn't be put on display or passed around. A letter or document written entirely in the hand of its author is called a holograph. This, of course, has nothing to do with a hologram. Holograms are not holographs, and vice-versa. A personal signature accompanies a letter or document. A stand-alone signature on a piece of paper or other item is an autograph. The letters that I have on file are due to a newsletter that I published long ago, but if you were to write to a holographer, I'm sure they would be glad to write a short note back. And don't pass over the beauty of the envelope. Many stamps are truly works of art unto themselves. The quality and feel of the paper, the design and printing of the letterhead, the penmanship -- get a feel for all these things when collecting letters, autographs and signatures. A more recent way to collect is through email. Many collectors are getting email addresses of holographers and asking them to return an email. Then they keep the email as if it were a letter. Just visit the websites of holographers around the world, and ask them if they would be kind enough to send an email back to you. Some collectors keep the email in its electronic form, others print it out, frame it and display it. This is a very exciting way to build and begin your collection and should not be overlooked. Just be sure to let the person know why you are requesting a return email, and be polite in your asking. Some newspaper and magazine articles, along with newsletters and press releases would be filed as originals whenever possible, or xerox copies when originals are not available. It is the collectors main goal however, to eventually track down original printed materials to eventually replace the xerox copies. Most magazine and newsletter publishers have back-issues available and will send you a copy if requested to do so (providing you send the appropriate costs plus postage). Of course, having an original issues verses a xerox is really a decision made by the collector based on individual preference. In the future, the original will be the most sought after, so the decision remains with the collector and their long term goals. Of course, don't forget that many publications have holograms either inside or on the cover. This is a great way to get a "two for one" deal: a published story on holography that contains a hologram. Several of the more famous newsletters that circulated about holography were Holosphere, from the New York Museum of Holography, and L.A.S.E.R. news, from the Laser Arts Society for Education and Research (California). There were also several wonderful Europen newsletters as well. From 1983 through 1994, I published a newsletter called The Holo-Gram. In the Summer 1988 issue, I introduced the world to Antiquarian Holographica, which is where the name (and this article) originated. How about patents? Patents make a great addition to any collection. Many branch offices of the Free Public Library now have patent searches right in the library itself. I got all of the patents in my own collection at the main library in center city Philadelphia and paid around 10-cents per sheet of paper. Of course, patents are now available online, so you don't even have to get out of your pajamas (although I'm not sure if there is a cost involved or not). Collecting postcards was one of the top hobbies in the world at one time. There was just nothing that could touch it. Postcards were used in holography primarily for announcing an upcoming exhibit or event. One would think that there would not be many postcards available, but that would be an incorrect assumption. I have several volumes filled with holography-related postcards going back to the 1970's. It is rare that a postcard would be sent today, in the age of the Internet, so I'm assuming that my collection may be close to being complete. If you ask around your area, you might find postcard shows throughout the year. Usually they are held by your local postcard clubs, and feature not only exhibits of antique postcards, but also have many dealer tables. A word to the wise: in all my years of postcard collecting, I have never, ever, found a holography-related postcard at a show or dealer booth. Ever. All of my postcards were collected in "real time", which means that as I continued through my life in holography, I obtained the cards that I have in the collection. It is a great hope of mine to one day find a holography-related postcard at a show. But, as of 2011, it hasn't happened yet. Postcard collectors are wonderful, friendly people. It can be a nice, quiet hobby (if you happen to like nice, quiet hobbies), and the shows and events are laid-back. If you travel around the Net, you'll find many blogs of young people who are discovering the joy of postcard collecting (and sending / receiving). In spite of what this electronic age may make you think, postcards are from being a dying pursuit, as the Internet is actually fanning the flames, rather than extinguishing them. Similar to postcards, display posters were used to announce exhibits and events, albeit in a grand way. These events were held around the world, although not every venue had the budget to produce an exhibition poster. You, the collector, will find most holography-related posters date from approximately 1975 through 1990. This was the most active, "peak" era for hologram exhibits around the world. Posters can eventually be worth a small fortune. There are posters from the early 20th century that are now fetching close to $100,000.00 (US). There is no doubt in my mind that holography-related posters will be a good investment over time -- however it remains to be see just how good, and how much time it will take. For some, return on investment (profit) is not only a very important part of their collecting objectives, but it is all that they think and talk about. And that's fine. The one important thing to remember is this: if a poster sells for $100,000.00, it means that someone bought it. That translates to poster collecting being a hot pursuit. Funny thing is, I don't know of any poster collectors, nor do I know of any poster collecting publications, or other such communication that usually takes place between collectors (and sellers). It must be a very quiet hobby, running very profitably below the surface. The vast majority of collectors (of all types) are happy to participate in their venture individually, while a small (but ever growing) number are reaching out to share their collecting interests with others. One of the ways that they are doing this is by opening their collection to visitors in their places of residence. In other words, they are turning their homes into mini museums. Some folks are converting their basements and rec rooms, others are doing the same with certain rooms of the house. A small number are devoting their entire homes to displaying and providing historical information on their collections! Whichever level you choose for your own situation, I hope that you do decide to share your holography collection with others. You don't have to have others come to you. You can put a small, portable display together and travel to all sorts of groups and organizations. Of course, being able to both have a small museum at home, AND also be able to do outreach to others would be the ultimate. One thing to remember is that museums are for education. Anyone can display their collection on walls, in cabinets or on shelves, etc. But for a museum to be a museum, the visitor or attendee must come away with increased knowledge about the topic of the collection: the who, what, where, when, how, and why of the selected pieces on display. I recently found a person who collects and displays bricks. Yes, bricks. But the story behind their manufacture and usage took the entire topic to a whole new level. There's one thing we can be sure of: there is always something interesting about ANY collection . . . or it wouldn't be collected in the first place. Having the ability to pass that information (and enthusiasm) on to others is key to having a great display. I'm actually a bit fascinated by bricks! If it weren't for setting up my holography history room in my home, I might not have discovered that I had what would be considered a "specialty" collection in my midst. You see, I always kept my collection sorted by items: holography-related postcards, posters, newsletters, etc. But there was one specific area that I had previously sorted by topic: religious. I found a cache of religious historical 3D items all tucked away inside of a filing cabinet all by themselves. It contained lenticular postcards, holograms, viewmaster, stereoviews, and other items . . . BUT . . . sorted by the *topic* of religion. To this day, I do not recall why I had religious items in a topic all of their own, but I have continued to add to it, and display it, separately. In my public history room, there is a display cabinet dedicated to exhibiting many of the items, and I plan on expansion very soon. In fact, religious 3D imaging is such a niche area, that it could be considered unique enough to be the "main" collection, with the rest of the collection as background support. So don't overlook any topical interest area that comes to the forefront. Go with the flow, put it front and forward, and have it as the centerpiece of your entire collection. When all is said and done, you are going to find that your collection falls under two main categories: hardware (equipment), and paper. Every piece in the collection would be able to be classified under one of the two headers. The biggest question is: where should the holograms themselves be placed? Out of all the items in the collection, the holograms do not fall under either a hardware (equipment) header, or a paper header (unless the hologram happens to be part of a printed piece). Best bets would be (as a suggestion) to have holograms as a completely separate category all their own . . . and everything else under either hardware (equipment) or paper. For now, that certainly makes the most sense. As we continue into the future, holograms will be, in my best guess, the main collectible of the majority of collectors. We will never see laser collectors outnumber hologram collectors. 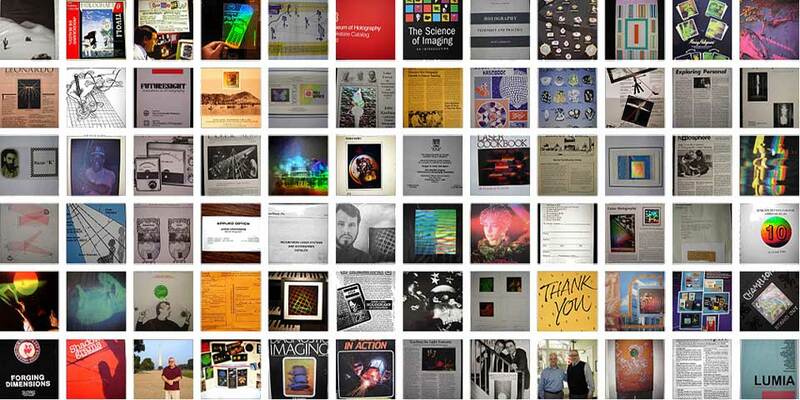 Nor will we ever see holography-related paper (ephemera) collectors outnumber hologram collectors. This is yet one more reason to have holograms have a category all of their own: they deserve it. As you, the reader, can see by now, there are nearly endless possibilities with holography-related collectibles. There are certainly enough physical items out there to match the possibilities. It is not always easy to find the items, however, even in today's world of online access. It will take a bit of hunting and patience on the part of each collector, but you'll find it well worth the time and effort. There is a lineage in collecting that many beginning collectors do not realize. We would begin with those persons that chose to acquire and save the original items the first time around. This determined not only which items made it to us today, but also which items were found interesting enough to not discard. Then there are the collectors of tomorrow. They will inherit the results of our collecting decisions today, which originated with the collectors of yesterday. And so it is with the arrow of time. A continuum. Of course I wish you the best of luck should you decide to begin your own collection of holography related items. This single web page has only touched the surface of the entire collecting sphere. Perhaps you are reading this in your home or office, or on a hand-held wireless device while commuting. It has been my pleasure to bring this information to you, and I am thinking of you, faithful reader, as I type these final words. 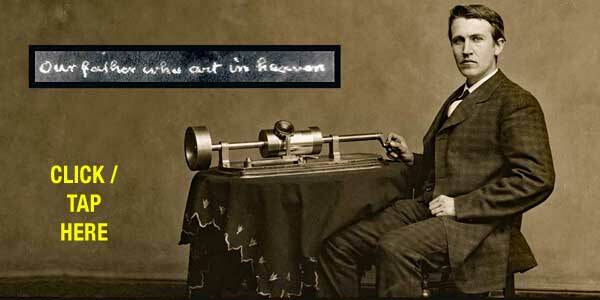 See and learn about Edison's hand written micro script of the Lord's Prayer.